I am absolute beginner and wanted to have a sound machine, no graphics at all. I have Masdec Duel-Turbo, probably US origin. It is too heavy for me because I have Fibromyalgia. Then I read your review of Tesoro Silver uMax and tought that it would be right for me. I bought it on eBay and got two extra coils. It really is light and I can use it without any problems. It is much better than Masdec (I really don't know what it really is of origin, perhaps White?). It had too many adjustments and even though I like equipments having much to tweak (I am Senior Electronic Maintenance Engineer) I think that in the detector simplicity is better. I am not trying to find anything specific now but just want to learn how to use this. Afterwards I hopefully know what is going to be my own interest. Actually I like to find anything from coins to rusted hinges, so very sophisticated discrimination is not needed, yet. I am convinced that this is the best machine you can buy for $250. I have several high end machines and this is not a high end machine..... However, a great machine. Depth is around 6-7 inches on most coins. Very easy to use and super light. Great entry level detector! Excellent detector! 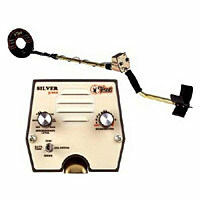 Been using this Silver uMax around a ranch to find the odd missing metal objects and looking for relics. Works perfectly. Been able to discriminate out the hundreds of nails and focus on other metallic objects, most made of copper, lead and silver. Soil ranges from clay, sandy loom, gravel stream beds, to hard pan. Set to All Metal mode with sensitivity set to 8-9 out in the open fields. Discrimination mode set to tune out Iron around buildings. Still dig plenty of iron if the signal is different from an old horseshoe nail. The unit is easily tuned to just a short "chirp" when passing over a nail. The unit will still sound off loud a clear for copper, lead and silver! Light weight, rugged simple and accurate! Great value! I take this detector into a place that is like detecting in the bottom of a trash can. Spring break just got over and I found $140 in clad, 27.7 grams of silver and 3.7 grams of 10k. I have owned this detector for 5 years now and it has paid for itself many times. Never had to send it in for a repair. By far my best detector and I do own a few and I use this one the most. The silver umax is fast, stable, light and a true coin and ring killer. I bought a silver umax for the dry sand at the beach. I have one rule for the discrimination to dig almost everything. I am very happy with my silver and I recommend it. Hi hunters, I bought this detector two years ago and I have to say, this is one of the best metal detector that I have ever used. It's reactions are really sharp and speed. It is right, that small silver coins what are deeper than 15 cm are problem, but every Cu coins are detected in the depth between 17 - 25 cm. I used to hunting war relics, because in Czech republic ale German and soviet relics in every wood and my opinion is, that in this price isn't better metal detector. First day with my girlfriends silver max I bought her was pretty good. We only skimmed our yard and found a dime and 3 pennies. Very impressed. Waiting on my outlaw to get here. Bought a Silver for my son and I found it easier and lighter than my other 4 "bells and whistles" detectors, so I bought another one just to carry in my car when I travel. It does remarkably well in Colorado where the soil can be quite mineralized in places. Even found a couple of gold nuggets with it. I've just about had every brand of detector and this one is one of my favorites. Simple to use, detects a decent depth and good price. I enjoy this detector as it is simple to use. This thing loves to sound off on silver dimes and quarters, not to mention all the wheat pennies and other old coins I'm finding. Using the stock coil and the little 5. 75 coil makes it a great machine. Planning to get the 9x8 and 10x12 coils soon. I set discriminate just high enough to reject iron and can still find great stuff. Set it at minimum to find small gold rings. I started a key collection as I have been finding lots of old keys. What a great hobby. The silver umax is American made too.